Jason Maguire is recovering at home after a fall which led to him being placed in a medically-induced coma. The 33-year-old Irish jockey, who won the 2011 Grand National on Ballabriggs, was hurt at Stratford on the eve of the Cheltenham Festival. Maguire was unseated from his mount Scots Gaelic in a handicap hurdle and kicked in the stomach by another horse. He suffered a fractured sternum and bleeding on his liver, but will be able to resume his career at some stage. His agent Chris Broad said the jockey, who was brought out of the coma last week, had been discharged from hospital on Thursday. "He's not going to suddenly start riding out again, but he is going to make a full recovery and will be back race-riding, hopefully sooner rather than later," said Broad. Maguire, the nephew of former top jockey Adrian, had part of his liver removed after being airlifted to University Hospital Coventry. He is one of five high-profile jockeys to suffer bad falls in March. 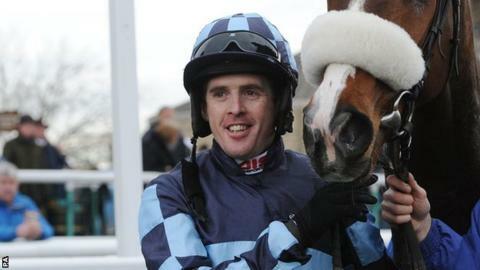 Bryan Cooper, Ruby Walsh and Daryl Jacob are all sidelined with broken bones after being injured at the Cheltenham Festival, while Martin Harley fractured four ribs and a bone in his neck at Lingfield.